An expanded trades and technologies centre opened at Lethbridge College in southern Alberta earlier this fall. Earlier this fall, an expanded trades and technologies centre opened at Lethbridge College. The 15,793-m2 (170,000-sf) facility—designed by Diamond Schmitt Architects in association with Sahuri + Partners—is one of the largest buildings in the southern Alberta city. The Trades Technologies Renewal and Innovation Project (TTRIP) supports a 50 per cent increase in students, with space and programming for an additional 880 placements at the college. The expansion organizes new workshops, labs, offices, and classrooms around a north-south central spine and adjacent learning commons. One of the priorities was to create an informal study and gathering space to encourage student encounter and the opportunity to continue learning outside the classroom or in a workshop setting. The first phase of the expansion added large automotive and heavy agriculture equipment bays to the Crooks School of Transportation, which opened in September 2015. The college set a high bar for energy-efficient design with a ‘net-zero utility cost to operate’ goal for the new facility, aiming to maintain the energy cost at no more than the smaller facility it replaced. “Energy modelling, user input, and process loads were analyzed and a comprehensive array of passive and active sustainable design features were implemented. Solar control, efficient glazing, and minimizing the area of the building envelope enhanced building performance so that it is now positioned to achieve a high level of LEED certification,” said Dan Gallivan, an associate at Diamond Schmitt. 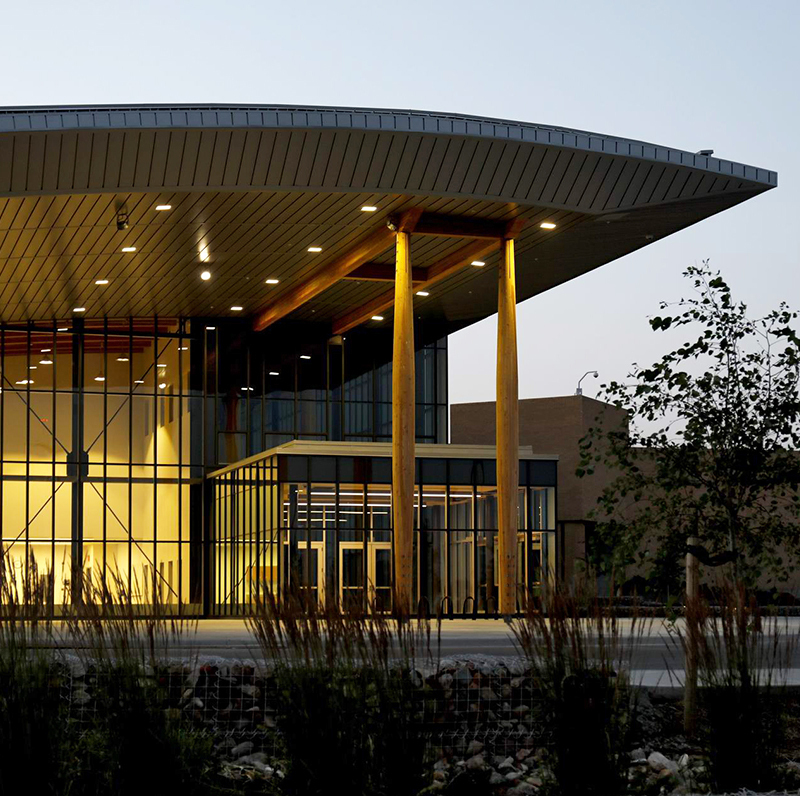 The swooping roofline—the building’s defining feature—references the region’s gently rolling coulees. A slender column supports an overhang to create a sheltered area at the main entrance. Eighty light tubes embedded in the undulating roof, along with clerestory windows, provide a high level of natural light to the large program areas. The facility is designed to be a learning tool. A variety of building techniques and materials such as structural concrete and steel, glued-laminated timber (glulam), masonry, and curtain wall glazing allow instructors to demonstrate construction methods and performance.